Love it or hate it, the brutalist style has influenced many. Here’s how. Arguably the most controversial design movement of the 20th century, brutalist architecture has its fair share of cultural and political baggage attached. And that's before you even take into account the aesthetic appeal of brutalist-style buildings. At one end of the spectrum we have the concrete monstrosities that litter the cityscapes of many Central and Eastern European countries, erected in uniform, pre-fabricated rows to house the populace while said countries were behind the Iron Curtain under strict Soviet control. However, there are plenty of famous buildings that utilise the Brutalist aesthetic and have gained widespread recognition for the right reasons. Descended from modernism in the post-war years, brutalism rose to popularity from the 1950s, largely thanks to Le Corbusier, lasting until the early 1980s. Besides Europe, examples can found across the United States, Australia, Israel, Japan and Brazil. The Tate – itself near the famously brutalist National Theatre on London's South Bank – explains that the name 'brutalism' was coined by British architectural critic Reyner Banham. "The term originates from the use, by the pioneer modern architect and painter Le Corbusier, of ‘beton brut’ – raw concrete in French. Banham gave the French word a punning twist to express the general horror with which this concrete architecture was greeted in Britain." For some, the utilitarian concrete structures of brutalist architecture are nothing more than outdated eyesores. But the movement has its advocates, and was recently celebrated by RIBA in its so-called Brutalist Playground. A collaboration between artist Simon Terrill and Turner Prize-winning collective Assemble, the immersive installation recreated a trio of post-war play structures from three London housing estates out of reconstituted foam, and is currently touring. One of Le Corbusier’s seminal projects, Unité d’Habitation (translation: simply ‘housing unit’) is one of the earliest approaches to brutalist architecture as we now know it. Conceived as a ‘vertical garden city’ of self-contained units around communal areas, this design principle was the modernist architect’s response to an urgent need for accommodation in the wake of World War Two. Completed in 1952, Cité Radieuse (‘radiant city’) in Marseille, France, is the best-known Unité d’Habitation building, and one of 17 Le Corbusier creations to make UNESCO’s World Heritage list. A stark grid of raw concrete is offset by bright panels of primary colours across the face of the 18-storey structure, which has been named a historic monument by the French Ministry of Culture. Hungarian-born, Bauhaus-educated modernist Marcel Breuer was the architect behind the imposing, top-heavy Breuer Building in New York City. Completed in 1966, it attracted its fair share of criticism at the time, but public opinion has since swung in its favour. The Breuer Building’s sharp angles and simple, stepped façade sits in bold contrast to the surrounding area of Manhattan’s Upper East Side. Formerly home to the Whitney Museum of American Art, it is now an outpost for the Metropolitan Museum of Art (better known as the Met). Like most of its counterparts in the brutalist architecture canon, its external and internal superstructure boasts a smooth, unadorned concrete finish, putting functionality first. Like Unité d’Habitation, Habitat 67 in Montréal was developed as a conceptual solution for affordable, modular apartment-based living in modern cities. It started life as a thesis by Israeli-Canadian architect Moshe Safdie while he was studying at McGill University, and by 1967 had come to fruition. Over 350 prefabricated modules comprise the Habitat 67 complex, which was inspired by the simple, versatile functionality of LEGO. Another example of brutalist architecture that attracted some flak at first, Boston City Hall was part of a drive in the 1960s to restore the US city’s former glory in the face of economic decline. Designed by Gerhard Kallmann and Michael McKinnell, it opened its doors in 1969. Le Corbusier’s influence is apparent in the building’s grid-like façade, which features angular, protruding modules that put a modern twist on the classic civic building style. It is now held up as an iconic example of brutalist architecture. Approaching London from the west, you can’t miss Erno Goldfinger’s distinctive example of brutalist architecture: Trellick Tower. Completed in 1972, the 31-storey block was intended to be an icon of harmonious public housing, but was already faced with growing disillusionment about the utopian ideal of tower block living. By separating elevators and stairwells from the apartments themselves, Goldfinger intended to maximise living space for residents. However, years of neglect and crime earned Trellick Tower the nickname the Tower of Terror. The 332-foot-high concrete structure – easily recognised for its narrow offshoot tower, linked to the main block by bridges on every third floor – has since been Grade II*-listed by English Heritage. It has survived various social reforms, including several apartments being bought and sold privately, and a fire in April 2017 that saw 200 people evacuated. It remains one of London’s most notable brutalist buildings. Designed by architecture firm Pfohl, Roberts & Biggie, the answer to the brutalist architecture movement in Buffalo, New York, is the city’s appropriately imposing law courts. Built in 1974, its sheer façade gives very little away, with narrow, vertical strips of windows dwarfed by vast pre-cast concrete panels. The thinking behind it was simple: fewer windows means fewer outside distractions for the courts inside. Brutal, simple, effective. Central and Eastern European countries may have had their fair share of faceless, identikit concrete superstructures thrown up during the Cold War, but there are some standout examples on the skyline as well. Built in 1977, the 35-storey Western City Gate in Belgrade is Serbia’s contribution to brutalist architecture. Architect Mihajlo Mitrović wanted it to resemble a domineering gateway, to greet new arrivals to Belgrade from the West. Western City Gate’s twin towers are linked at the top by a two-storey bridge, crowned by a revolving restaurant. Given that one of them plays host to engineering firm Genex Group, the building is commonly referred to as ‘Genex Tower’. Perhaps London’s best-known example of brutalist architecture, the Barbican literally rose from the ashes. Following an air raid in 1940, an enormous 35-acre site at the heart of the UK capital’s financial district was bombed to rubble. Driven by the post-war housing shortage, and inspired by Le Corbusier’s Unité d’Habitation project, architectural firm Chamberlin, Powell and Bon put forward a proposal in the 1960s for concrete ’vertical cities’. In between the stark high-rise blocks, Chamberlin, Powell and Bon planned gardens and a lake, adding horizontal rows of traditional townhouses to break up the space, and linking the complex together with footbridges to separate pedestrians from cars. Nowadays, the complex plays host to a cinema and restaurants, as well as schools and around 2,000 apartments. While the housing project was completed by the 1970s, the Barbican Arts Centre itself only opened in 1982, its distinctive mottled façade created by chipping away at cast concrete. Italian-born Brazilian modernist architect Lina Bo Bardi was tasked with transforming an old drum factory in São Paulo, Brazil, into an arts and cultural centre. In a bold, brutalist move, she chose to strip the plaster away and sandblast the walls, exposing the structure beneath, and the first phase was revealed in 1982. Adhering to brutalist architecture’s core tenets of simple, exposed materials and harsh, angular forms, SESC (Serviço Social do Comércio – Business Social Service) Pompéia juxtaposes stripped red brick with stark concrete towers, linked with irregular, criss-crossing aerial walkways. In a final nod to its industrial heritage, the imprint from the original timber framework is still visible on the building’s exterior shell. 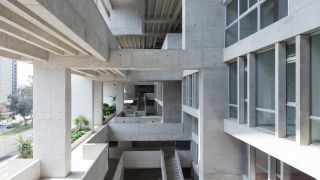 Finally, as if to prove the point that brutalist architecture’s controversial look and feel is enjoying something of a resurgence, 2016’s inaugural RIBA International Prize went to Dublin-based Grafton Architects for the Universidad de Ingenieria y Tecnologia in Lima, Peru. Designed to recognise a “transformative building which demonstrates visionary, innovative thinking, excellence of execution, and makes a distinct contribution to its users and physical context”, the prize in this case honoured a classic brutalist high-rise design, described by jurors as a "bold new addition to the city skyline". Its grid-like modular façade, cast in concrete, would surely make Le Corbusier proud.